Be prepared with the Impression memory foam folding bed. Easy to store and highly comfortable. Sure to impress guests with its memory foam mattress. 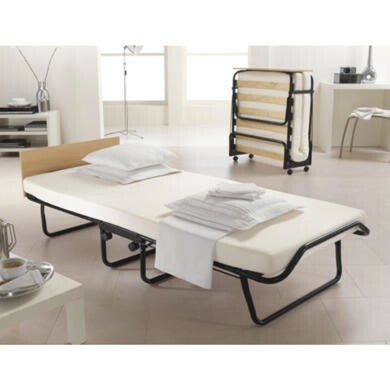 The Impression memory foam single folding bed is ideal for anyone let alone those who are struggling for space. Have a bed ready for guests in seconds. 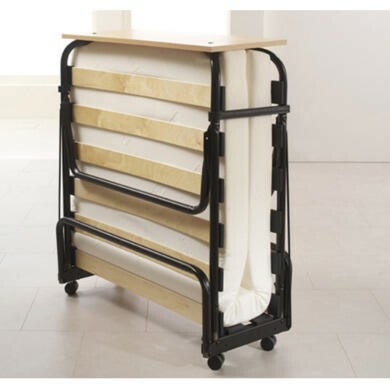 Light weight and folding in to a compact shape with easy move castors you can store away this bed no problem. Slip the folding bed under your bed, down the side or on top of a wardrobe, put it in your car boot and take your own bed next time you’re a guest somewhere. This fold out bed has a fresh and simple look. With a clean design the Impression memory foam folding bed will never date. Finished with a durable epoxy paint for a long lasting new look. This bed has been made to last a life time. The frame of the bed is steel with a highly durable epoxy paint finish. The bed base is wooden sprung slats offering durability and comfort. The mattress its self is a memory foam mattress. Combining rebound foam for added support with a top layer of viscoelastic memory foam for personalised pressure relieving comfort. This bed is highly durable and hardwearing, built to last the test of time. No damage should come to the frame when it’s folded and being moved as it has 360 degree castors to make manoeuvrability easy. You can’t be too harsh with the frame whilst setting the bed up as its automatic and all that’s required is a simple unfold from you. The frame has a lifetime guarantee from Jay-Be. Assembly is very minimal. All you will need to do yourself is attach the castors and the wooden headboard. Answer from LucyConway Hi, We confirm that this product is tested up to 18 stone. Thank You, Lucy.